Costume jewelry, imitated jewelry; trinkets, fashion jewelry, junk jewelry, fake jewelry, or fallalery is jewelry manufactured as ornamentation to complement a particular fashionable costume or garment as opposed to "real" (fine) jewelry, which may be regarded primarily as collectibles, keepsakes, or investments. An earring is a piece of jewelry attached to the ear via a piercing in the earlobe or another external part of the ear. Earrings are worn by both sexes, although more common among women, and have been used by different civilizations in different times. Cufflinks are items of jewelry that are used to secure the cuffs of dress shirts. Cufflinks can be manufactured from a variety of different materials, such as glass, stone, leather, metal, precious metal or combinations of these. Securing of the cufflinks is usually achieved via toggles or reverses based on the design of the front section, which can be folded into position. There are also variants with chains or a rigid, bent rear section. The front sections of the cufflinks can be decorated with gemstones, inlays, inset material or enamel and designed in two or three-dimensional form. A ring is a round band, usually of metal, worn as ornamental jewellery. The term "ring" by itself always denotes the finger ring, but when worn as an ornament elsewhere, the body part is always specified, e.g. earrings, neck rings, arm rings, and toe rings. Rings always fit snugly around or in the part of the body they ornament, so bands worn loosely, like a bracelet, are not rings. Rings may be made of almost any hard material: wood, bone, stone, metal, glass, gemstone or plastic. 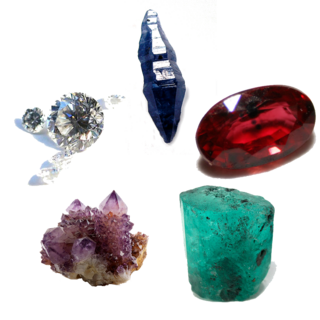 They may be set with gemstones or with other types of stone or glass. A plug, in the context of body modification, is a short, cylindrical piece of jewellery commonly worn in larger-gauge body piercings. Modern western plugs are also called flesh tunnels. Because of their size—which is often substantially thicker than a standard metal earring—plugs can be made out of almost any material. Acrylic glass, metal, wood, bone, stone, horn, glass, silicone or porcelain are all potential plug materials. Kandyan jewellery comes from the hill capital of Ceylon or Sri Lanka. The Kandyan Kingdom lasted till 1815 resulting in the original sets of jewellery and designs still being preserved and worn by Kandyan families today. Native American jewelry refers to items of personal adornment, whether for personal use, sale or as art; examples of which include necklaces, earrings, bracelets, rings and pins, as well as ketohs, wampum, and labrets, made by one of the Indigenous peoples of the United States. Native American jewelry normally reflects the cultural diversity and history of its makers, but tribal groups have often borrowed and copied designs and methods from other, neighboring tribes or nations with which they had trade, and this practice continues today. Native American tribes continue to develop distinct aesthetics rooted in their personal artistic visions and cultural traditions. Artists may create jewelry for adornment, ceremonies, and display, or for sale or trade. Lois Sherr Dubin writes, "[i]n the absence of written languages, adornment became an important element of Indian communication, conveying many levels of information." Later, jewelry and personal adornment "...signaled resistance to assimilation. 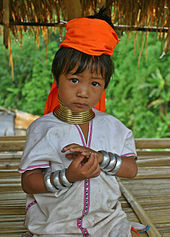 It remains a major statement of tribal and individual identity." Ancient Egyptian clothes refers to clothing worn in ancient Egypt from the end of the Neolithic period to the collapse of the Ptolemaic Kingdom with the death of Cleopatra in 30 BC. 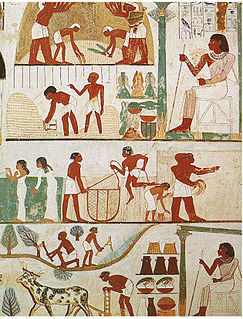 Egyptian clothing was filled with a variety of colors. Adorned with precious gems and jewels, the fashions of the ancient Egyptians were made for not only beauty but also comfort. Egyptian fashion was created to keep cool while in the hot desert. The Middle Ages was a period that spanned approximately 1000 years and is normally restricted to Europe and the Byzantine Empire. The material remains we have from that time, including jewelry, can vary greatly depending on the place and time of their creation, especially as Christianity discouraged the burial of jewellery as grave goods, except for royalty and important clerics, who were often buried in their best clothes and wearing jewels. 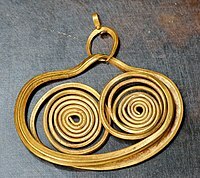 The main material used for jewellery design in antiquity and leading into the Middle Ages was gold. Many different techniques were used to create working surfaces and add decoration to those surfaces to produce the jewellery, including soldering, plating and gilding, repoussé, chasing, inlay, enamelling, filigree and granulation, stamping, striking and casting. Major stylistic phases include barbarian, Byzantine, Carolingian and Ottonian, Viking, and the Late Middle Ages, when Western European styles became relatively similar. Tamil people have historically been connoisseurs of fine golden jewellery, which has a history predating the Sangam period in the Indian subcontinent. Ancient Tamil literature lists out the different types of jewellery worn by women historically from head to toe. Apart from gold, jewellery was also fashioned out of silver, copper and brass. Mughal clothing refers to clothing developed by the Mughals in the 16th, 17th and 18th centuries throughout the extent of their empire in the Indian subcontinent. It was characterized by luxurious styles and was made with muslin, silk, velvet and brocade. Elaborate patterns including dots, checks, and waves were used with colors from various dyes including cochineal, sulfate of iron, sulfate of copper and sulfate of antimony were used. Ancient Roman jewelry was characterized by an interest in colored gemstones and glass, contrasting with Greek predecessors, which focused primarily on the production of high-quality metalwork by practiced artisans. Various types of jewelry were worn by different genders and social classes in Rome, and were used both for aesthetic purposes and to communicate social messages of status and wealth. Turkmen jewelry is a type of jewelry originating among the various Turkmen cultures of Western and Central Asia. The jewelry was crafted both for cosmetic and spiritual reasons, and the amount of jewelry an individual adorned themselves with was equated to the person's rank in society.